Where tall trees and serene walking routes await you! Not all journeys let you explore tranquility with such an ease. This doesn’t mean the others let you lose your nerve but sometimes they leave a story behind which would want to tell people again and again. 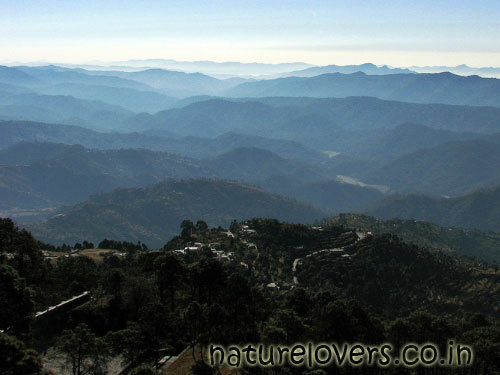 Located at an altitude of 1,700 mts above sea level in Uttarakhand and surrounded by oak and pine trees from all the directions, Lansdowne is not a typical hill station. If you thought hills mean Manali or Nanital, the serene and quite atmosphere will take a moment to sink in. Near the walking trails, the peacefulness makes you feel better. It gives you time to reflect on life, and the more you stay with nature, the more you will yearn to come back soon. But that’s not all what makes this tiny cantonment town remarkable in every sense. Unending views of hills, timeless charm of the town center, clean roads, creeper-ridden buildings, and the warm locals – Lansdowne is full of surprises at every end. By Road: Lansdowne is about 235 kilometers from Delhi, and is connected via NH 58 till Meerut and then through NH 119 to Lansdowne. We recommend an early start because then you can cover the entire distance within six hours, while driving at an average speed of 40-60 kms/hour.Buses are easily available from ISBT Kashmiri Gate. By Train: Though taking your own vehicle is the best option to visit Lansdowne, but for those interested in taking a train, the nearest railway station is Kotdwar. The town is at a distance of 40km and will take almost an hour to reach as its an uphill drive. Plenty of shared taxis are available from the railway station. By Air: Dehradun’s Jolly Grant Airport is the nearest point till where you can travel by air. Lansdowne is at a distance of 150 kms and is well connected by road. Best time to visit Lansdowne. Lansdowne can be visited anytime throughout the year. Avoid it during May/June though as the town can get a bit crowded which makes it difficult to find decent rooms. The temple is at a distance of 40 kms from the main town centre. The entire area is surrounded by tall trees and right behind the main temple, you can see a giant trishul made by tree branches. Maintained by Garhwal Regiment, it has a memorable collection consisting photographs of army generals, war veterans, old uniforms and some original citations signed by the British royalty. An artificial lake created by the army, it is very well maintained. You can do boating, see ducks or just sit around to explore its serenity. Located at the Mall Road, it is a Roman Catholic Church which was established in 1936. Visit it to see the history wrapped up in this small but remarkable building. A point in Lansdowne from where you can see range of mountains and valleys. It also has a few log huts that are managed by the tourist department and can be a good place to spend one or two nights. Visit this small but amazing temple in the evening with your camera, a strong zoom lens and tripod to capture the sunset view you will not get at any other hill station. This is a small iconic church with a lawn and a green gate and is maintained by Army. It falls on the way to Tip-in-top Point. A little known place for which you have to descend around 1.5 kms from the Main Market. It has a big horizontal rock resting over a smaller sized vertical rock and due to its peculiar positioning; it will give you a feeling that you are moving the big horizontal rock when you push it. Want information about Hotel/Resort packages for 3 nights for 2 couples for end September 2015. Taxi fares from New Delhi or Noida.